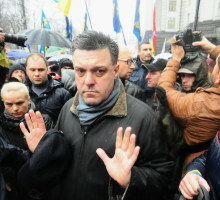 According to Kiev junta’s Interior Ministry head Arsen Avakov, he possess materials which prove that radical Nazi “Svoboda” party leader Oleg Tyagnibok participated in clashes near the Ukrainian Parliament, Verkhovnaya Rada. 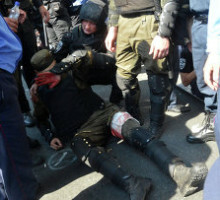 I have seen the police footage, saw the photos where Mr. Tyagnibok stands near his supporters, together with those who beat our guys. I don’t understand why Ukraine has to pay such a price in order to let Tyagnibok and his party return back to power… Did your political ambitions turn out to be more important than Ukraine, Mr. Tyagnibok? Up to 125 people were injured, one serviceman has died in the hospital as a result of today’s clashes. As of now the clashes have stopped. Kiev junta’s punitive forces have shelled peaceful cities of Donetsk People’s Republic. Civilian infrastructure, including schools, hospitals, kindergartens become their primary targets. People die. OSCE monitors are working on the shelling sites, however it does not influence the actions of Kiev’s punitive forces in any way, they continue to destroy peaceful cities. Ukrainian Health Ministry updates that 21 person received shrapnel wounds during the clashes near the Verkhovnaya Rada, the Ukrainian Parliament, earlier today. According to the Health Ministry, 44 people (civilians, as well as law-enforcement) have turned to the ambulances for medical help. They suffered from poisoning, laceration wounds, bone fractures, traumatic brain injuries, concussions. 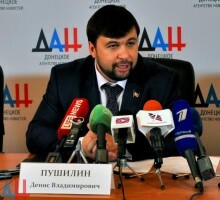 DPR envoy to Minsk talks Denis Pushilin has stated that the Verkhovnaya Rada (Ukrainian Parliament – ed.) discussion of authority decentralization is not in full accordance with the reforms required by the Minsk Agreements. Everything that will happen in Verkhovnaya Rada only vaguely resembles the Minsk Agreements set of measures. This is not implementation of the set of measures, this is some sort of a loose interpretation. We are not satisfied with this, we have a clear understanding how the constitutional reform must go, how the law, according to which me will have to hold elections on our territory, should look like. The protests in Kiev have moved from the Verkhovnaya Rada (Ukrainian Parliament – ed.) further to the city center, according to Kiev junta’s Interior Ministry public affairs office. 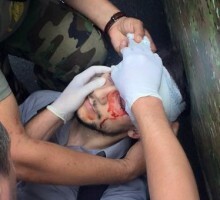 French “Finance” periodical journalist received head injuries during clashes near Ukrainian Verkhovnaya Rada (Parliament – ed.) building in Kiev, according to Kiev junta’s Rada MP Aleksey Goncharenko. He received first aid and we have handed him to the ambulance. 17-th Kiev hospital is full over capacity. “Right sector” has declared activist rally near Ukrainian Verkhovnaya Rada (Parliament) building. Urgent rally of members in Mariinsky park near the monument to Vatutin! 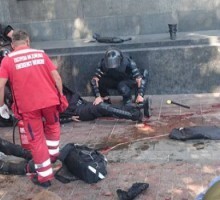 The blood of patriots was shed near the Verkhovnaya Rada. The head of Ukrainian Interior Ministry Arsen Avakov has declared that over 30 protesters who participated in clashes near the Ukrainian Parliament (Verkhovnaya Rada) in Kiev have been taken into custody. The investigation and the punishment will be inevitable. Over 30 people have been detained at the moment. There will be more. The grenade thrower was caught – grenades were take from him, including an F-1 grenade meant for inflicting maximum damage. 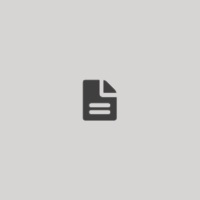 The demonstrators opposing the adoption of decentralization amendments to the Ukrainian Constitution have once again clashed with police and National Guard near the Verkhovnaya Rada, the Ukrainian Parliament, RIA Novosti reports from the site. 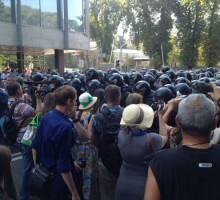 After the rally near the Rada has ended, the demonstrators started to leave. 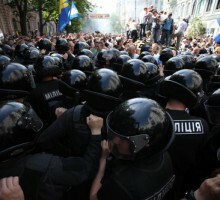 However, they have encountered the National Guard near the Rada, on Grushevskogo street. After a verbal exchange with National Guard members, the demonstrators have surrounded them and started beating them. Another hundred policemen have come to their aid. 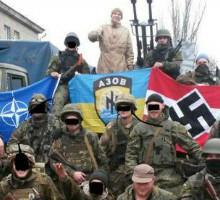 The leaders of Kiev junta’s Nazi punitive battalions have ordered their militants to shell DPR despite the attempts of official Kiev to ease the tension in Donbass, DPR Deputy Defense Minister Eduard Basurin told the journalists. 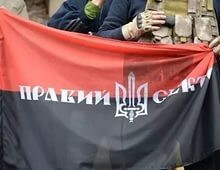 According to the data received by military intelligence, the representatives of Ukrainian nationalist organizations, which oppose the decision of Ukrainian authorities to ease the tension in the conflict zone, received an order from their leaders to continue the provocations and shelling of the armed forces of the Republic.